I’ve had my eye on this place in east end Ottawa for quite some time, thinking it would make a great photograph early one morning as the sun comes up. The weather hasn’t really cooperated lately….until this morning! Things cooled off significantly in Ottawa last night with an overnight temp around 9C. I awoke at 6 am as usual, knowing I had to pick up Chris after a night shift. As soon as I put up our blinds, it dawned on me (pun intended) that today was the morning to get this photograph. I quickly grabbed my camera and was out the door. As I drove out to the farm off Ramseyville Rd, I could see the rising sun as it ducked in and out of cloud cover. 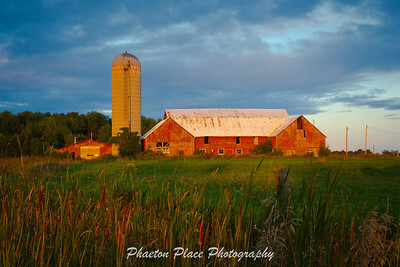 I pulled up in front of the farm, quickly framed what I thought would be a great shot and rapped off half a dozen frames before the sun disappeared for good behind an even thicker layer of clouds. It's beautiful scenes like this that make it worth being a morning owl. It's a great photo. Not sure I would have had the energy or the desire to hop out of bed so early. Guess I'll never get those great shots!! Very nice photo!! Glad you seized the moment!